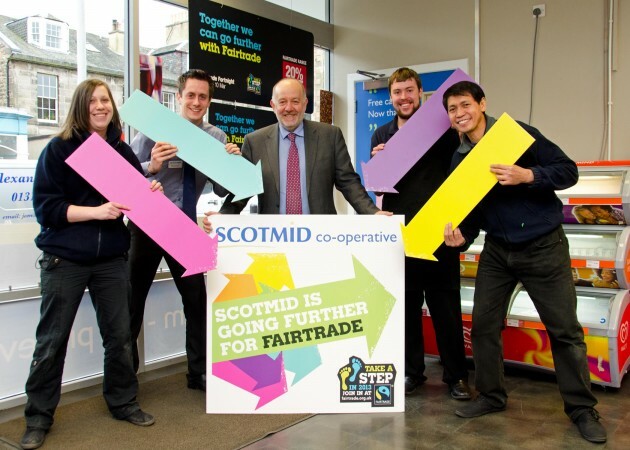 Scotmid Co-operative is encouraging customers and the local community to join them in going further this Fairtrade Fortnight (25 February to 10 March 2013), by getting involved in Fairtrade activities in their area and switching to Fairtrade products. The Society, which stocks Fairtrade products in all of its Scotmid Food stores, will be supporting community events across Scotland to promote Fairtrade – from a Fairtrade Football Festival in Angus to a Fairtrade wine tasting in South Queensferry. Scotmid Co-operative will also be actively promoting Fairtrade with local schools, with a number of projects underway to educate and engage students with the initiative. This includes an art project with local primary schools, which asks pupils to draw ‘what Fairtrade means to me’ on signs to be displayed in their local Scotmid store. The Society is also helping more schools to achieve their Fairtrade status. To encourage customers to switch to Fairtrade, Scotmid Food stores will be offering a 20% discount on many Fairtrade products including tea, coffee and chocolate during Fairtrade Fortnight. Local schools will also be visiting Scotmid stores to learn about the importance of making informed choices about products when shopping. “Fairtrade Fortnight is all about raising awareness of the real difference we can make to millions of people in developing countries by supporting Fairtrade. Scotmid is proud to have been a champion of Fairtrade for many years and in 2013 we are supporting events up and down the country to get more people involved than ever before. We’ll be giving talks at local schools, holding Fairtrade events in our stores, donating food for Fairtrade Tuckshops and supporting many other initiatives to educate people of all ages about why Fairtrade is so important.